The term BRICs puts under a common label the four largest fast growing emerging countries: Brazil, Russia, India and China. The BRICs show many common features, such as big land size, large population, fast economic growth etc., but important differences as well, due to their different models of economic development and resources endowments. In this report, we discuss the different models of economic development of the individual BRIC countries, with a special focus on their external relations (trade, FDI) and on likely future developments. Brazil is a domestically oriented service economy; Russia's economic development is heavily dependent on energy and raw material resources; the Indian economy is essentially service-led, supported by exports; and China's economic development is driven by manufacturing exports and investment. 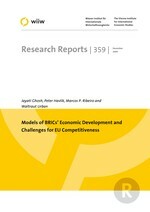 Finally, we explore the resulting future challenges and opportunities for EU competitiveness.